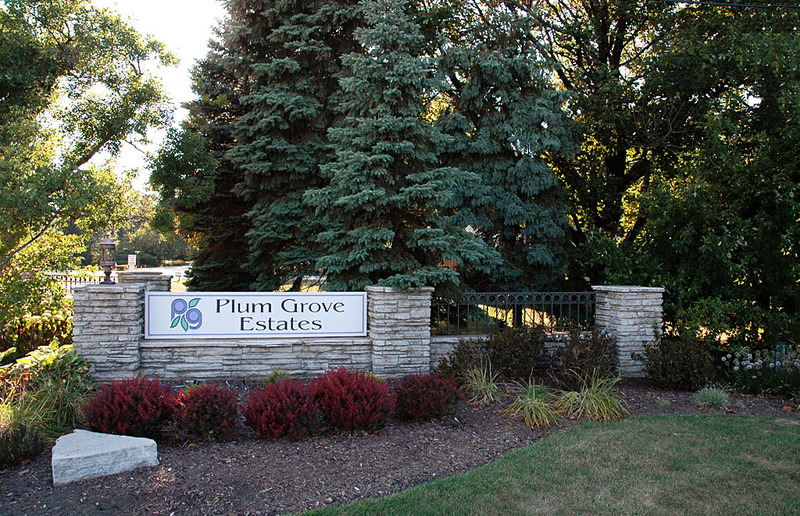 Palatine’s Plum Grove Estates is a bit of a hidden gem. Although the entrances that lead to the subdivision are off of fairly busy roads, you might not even know it’s there. It’s not all that common to find a neighborhood this beautiful and this well-integrated with the surrounding nature, while being so close to so much. Immediately west of Route 53 (290) and 5 minutes north of Woodfield (if that), Plum Grove Estates incorporates a series of winding roads that roll gracefully over the hills and dips in the landscape. It’s a lush haven for many fine examples of mid-century architecture, and includes countless century-old trees and beautiful ponds that lend a serene tranquility to this refuge within the busy northwest burbs. Salt Creek also runs through Plum Grove Estates, and where it crosses under Briarwood Lane – the street that runs through the subdivision from Plum Grove Rd. to the Rte. 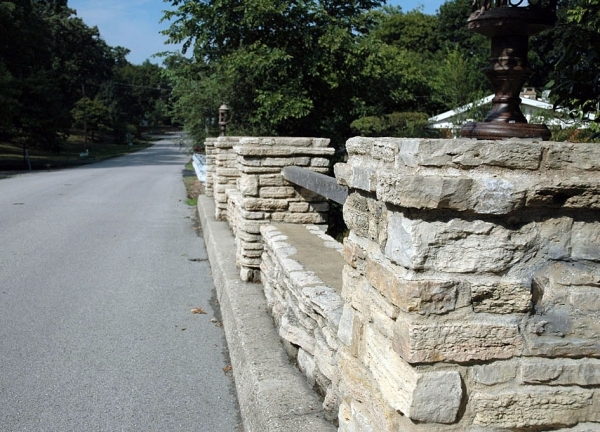 53 frontage road – there’s an architecturally-significant, mid-century stone & concrete bridge, built in 1954 as part of the subdivision’s master plan. 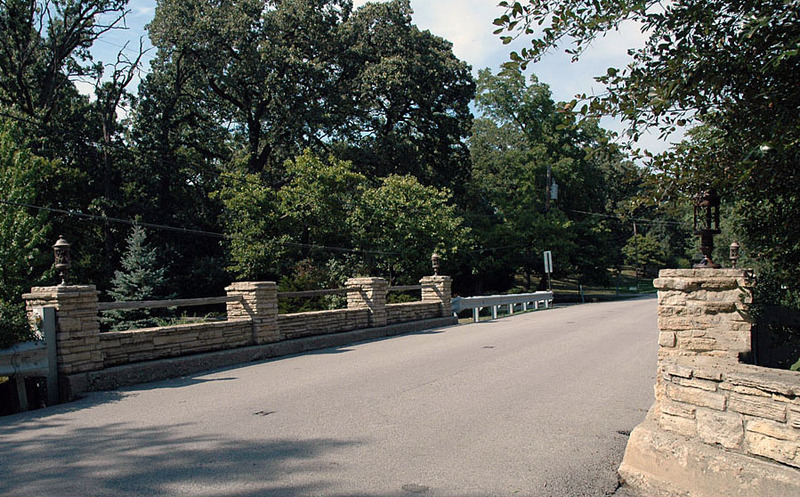 The Save Briarwood campaign is focused on this bridge, as well as the section of Briarwood closest to the bridge. Unfortunately, the Palatine Township Road District (PTRD) wants to replace the bridge and modify the flow of Briarwood Lane at the significant taxpayer cost of approximately $1 million. PTRD’s plan will adversely affect many elements that make Plum Grove Estates a standout community, not only by destroying the original stone bridge, but by cutting down mature trees, and by changing the course of Briarwood Lane in such a way that will encourage traffic to travel at higher speeds, reducing the safety of the roads, which have been shared by pedestrians, bikers and cars for over 50 years. Many residents in Plum Grove Estates are opposed to the plan. Members of the community have taken it upon themselves to get experts to show that the bridge doesn’t need to be torn down and replaced. The community has proposed an alternative plan that involves repairing the bridge deck, without replacing, widening or elongating the bridge and without altering the flow of Briarwood Lane or resorting to cutting down mature trees. I encourage you to look through the Save Briarwood website where, in addition to information about the campaign and the petition, you’ll find a scan of an original brochure detailing the benefits of home ownership in Plum Grove Estates. There’s also some cool information about the community’s land planners (Carl L. Gardner & Associates) and landscape architect (Harold O. Klopp), both of whom were recognized as leaders in their fields. 2 Responses to "Plum Grove Estates’ Campaign to “Save Briarwood”"
Yes, I’m a Realtor, too, and it can be difficult finding out good info about this. I’m not sure what, if anything, has been done in the area. I do know that Plum Grove Woodslands (the last 2 streets before Plum Grove) replaced their community sewer system a couple years ago, although that wouldn’t affect PGE’s flooding issues at all. Part of PGE is just very low, and with Salt Creek right there, I’m not sure there’s any way to berm / drain an area to keep it from flooding in those areas near the bridge on Briarwood that are just low.